Yesterday in Lisbon i was very pleased to assist at LisbonHalf,one of the fastest race on this distance. Organization totally perfect and my congrats to them. A race where women started before men with a solution more tactitc at the beginning while in men,Wilson Too as pacer,went out incredibly fast probably killing the hopes of gold for someone who followed him in a impressive 21.44 at 8k..
Mo Farah intelligently understood pace was too fast and choose the solution to leave this group away (with Kibet,Adola and Micah Kogo ) and coming to finish with his own pace.At 14k the maximum gap in 12sec,with lead in 39.13. In last part Mo did his show closing slowily every km more on the head of the race before going away with Micah Kogo. 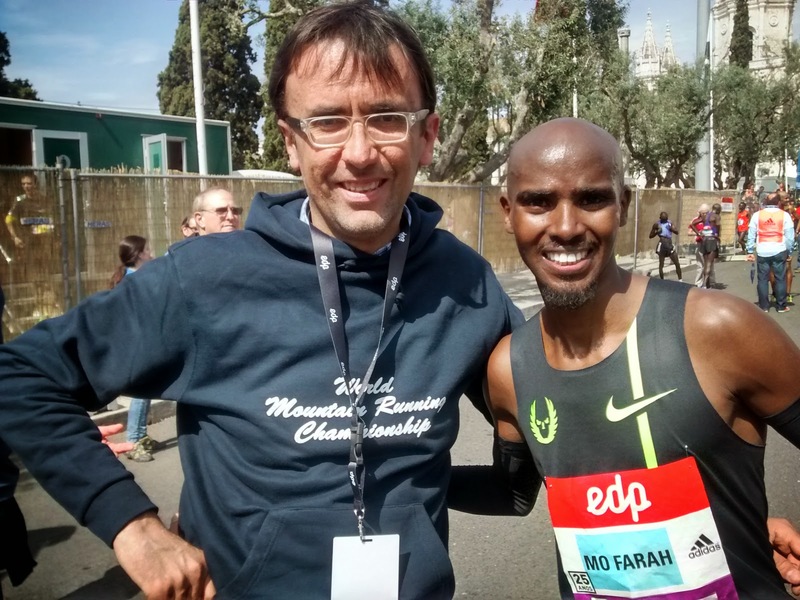 Honestly i dont believe in 18km splits...think some mistakes otherwise 2.06 at km in that moment..
After the finish,i did this interview where Farah had spoke about the race and more on his future and road-career.